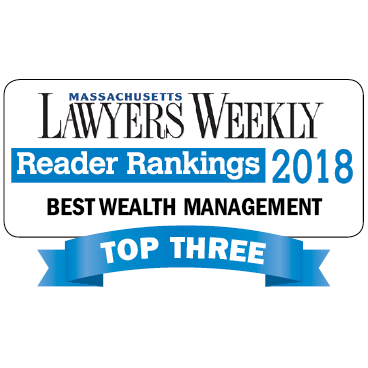 BOSTON – September 12, 2018 – We are pleased to announce that Fiduciary Trust Company has been named a Top Three Wealth Manager by the readers of Massachusetts Lawyers Weekly. This marks the second consecutive year that Fiduciary Trust has been recognized in the Best Wealth Management category. Last year, Fiduciary Trust was voted the top wealth management firm by Massachusetts Lawyers Weekly readers. This recognition of Fiduciary Trust comes on the heels of several other recent honors. In August, Family Wealth Alliance named Jody King, Fiduciary Trust’s Vice President and Director of Financial Planning, a finalist in its Thought Leadership category, and Fiduciary Trust Charitable was nominated in FWA’s Noteworthy Newcomer category. Fiduciary Trust is also a finalist for a WealthManagement.com Award in the Custody category for Corporate Social Responsibility/Diversity. In July, Boston Business Journal named Fiduciary Trust as a Top Corporate Charitable Contributor and ranked Fiduciary Trust as the fifth-largest independent adviser in Massachusetts. Fiduciary Trust is a privately owned wealth management firm focused on families, individuals and nonprofits seeking objective advice to help grow and protect their investments. The firm also provides a range of services to professional financial advisors and single-family offices. Fiduciary’s capabilities include customized wealth planning, investment management, trust and estate services, and family office, tax and custody services. For additional information about Fiduciary’s services, please visit www.fiduciary-trust.com, or contact John Morey at 617-574-3459 or jmorey@fiduciary-trust.com.